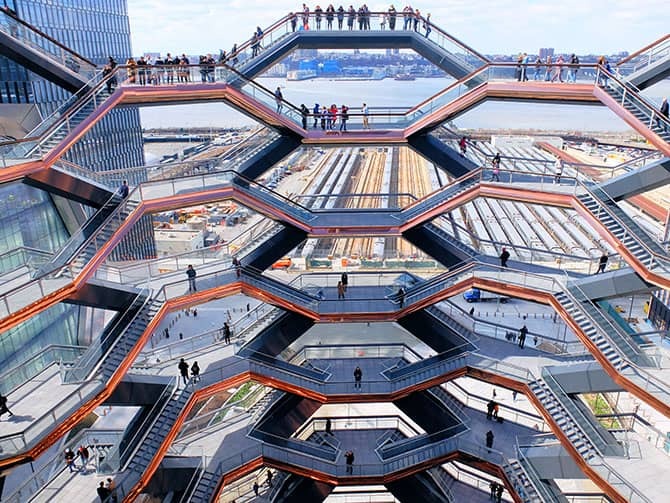 Hudson Yards Vessel in New York, also known as New York’s Staircase, is a construction at High Line Park. Made up of a number of staircases, connected by platforms, in the form of an oval; it’s difficult to explain what Vessel is exactly. I can, maybe best describe it as being somewhere between a building, a work of art and a monument. Above all, it’s a real eye catcher in Hudson Yards, at the end of High Line Park. Vessel is the brainchild of British designer, Thomas Heatherwick. You need a free ticket to enter. You can reserve tickets online, and there are also a limited amount available on the spot. 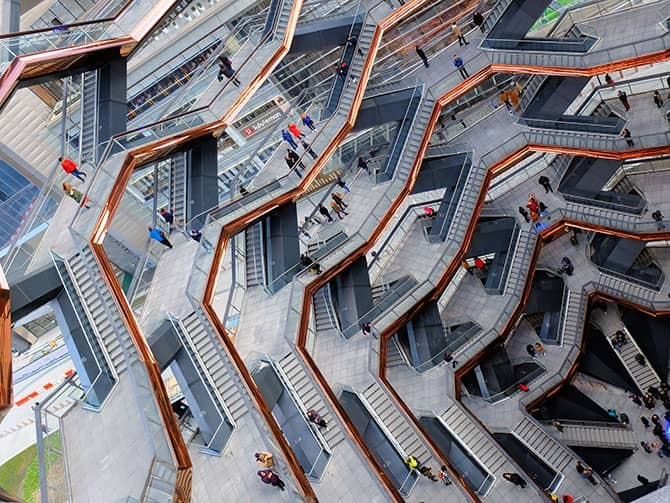 Vessel is definitely an attention grabbing construction, comprising of 154 interconnecting flights of stairs, with no less than 2,500 steps. In addition, it is 15 storeys high, so a climb to the top is definitely a workout! The views from the 80 viewing platforms, however, promises to make it all worthwhile. The recurring forms in the structure are reminiscent of Escher’s drawings. Although, everyone seems to see something different in its unusual shape. For example, a honeycomb, a beehive, a climbing frame or even a basket. Vessel is in Manhattans’ newest neighbourhood, Hudson Yards. To be precise, in ‘Public Square and Gardens at Hudson Yards’, a community park full of plants and trees. You will be able to see it if you are taking a walk over the High Line. This sprawling park is the epicentre of the eastern part of Hudson Yards, which further consists of eight buildings with various purposes such as offices, housing and commercial spaces, plus a cultural institute called The Shed. In addition, there’s the 30 Hudson Yards building which is home to the Edge Hudson Yards Observation Deck. This part of Hudson Yards lies between 30th and 34th Street and 10th and 11th Avenue. Eric’s Tip: I really liked Vessel, it’s absolutely worth visiting. It doesn’t cost much time, half an hour is probably sufficient for most visitors. It’s close to The High Line and great to combine with visiting other places in Hudson Yards. For visitors with reduced mobility there’s an elevator available. And make sure to hold on to your camera when you hold it over the railing for a selfie! When the above tickets are sold out or if you would like to visit Vessel with a guide, then you can book this other tour for the Vessel, Hudson Yards and High Line Park. The tour will start near Chelsea Market. Here you enter the High Line and walk the old train tracks that turned into a park. At the end of the High Line you’ll find the Hudson Yards area, including the Vessel. You’ll climb the impressive structure and have a view of the city from this unique perspective.